WE MAY HAVE had a few days of sun already this summer but we all know we can’t depend on that to last and so a trip outside the Emerald Isle is probably on the cards for many of you. And your pets deserve a little R&R on a Mediterranean beach too, after a long year of paw-giving, hairball-producing and generally making your life more… interesting, right? Bringing a pet on holidays can seem like a daunting task as there are so many different rules and restrictions to follow. To help you and your jet-setting animal companions, here are some of the most important things you need to know about taking them on holidays with you. EU pet passport rules apply throughout the European Union and it is your responsibility to ensure that you have the correct documentation for your pet. The ISPCA stresses the importance of ensuring your pet is wearing a collar, an ID tag and is micro-chipped also giving the temporary address in the event he/she gets lost so they you can be reunited as quickly as possible. Animals will have to be vaccinated against rabies and specific tapeworm treatment for dogs is often required. When entering countries like the US, border control for your pets will be as strict as it is for humans. Cats and dogs have to be rabies vaccinated and any dog coming from a country affected by screwworm will have to have a special certificate from a vet. It is also recommended that you refrain from using any natural bedding like straw or hay which may harbour pests and make sure their feet and bedding is free of excessive mud. With regard to quarantine, countries are split into three different catagories with rules for travel to and from the various catagories. This website has a great breakdown of which countries require an animal be quarantined and which ones don’t so make sure you check that out before booking your trip. Since Ireland is a rabies-free country, you will be able to enter any other country with minimal paperwork and without quarantine but it’s possible that there could be issues coming back from certain countries where there is a high incidence. Airlines all have different rules on pet travel so you should always check this on their website before booking flights. Ryanair, for example, does not carry animals on flights except for guide dogs and even then, only on certain routes. On Aer Lingus flights, no animals are allowed on shorthaul trips but you can take them on most other flights where they will be transported in the cargo hold. Other airlines lines like KLM will allow you to take cats and smaller dogs into the cabin with you, once they are kept in a suitable kennel or pet travel bag. 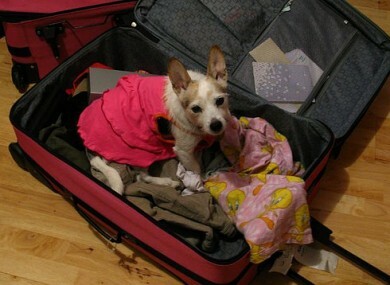 Carmel Murray of the ISPCA said petowners should keep in mind that long journeys including the flight, transportation to and from the aircraft and waiting times can be “stressful for your pet especially if delays occur so you take this into consideration”. If your pets have a fear of flying, you can always travel by boat and this may be a more comfortable and less stressful way for your pet to travel as they can be kept in the car or in on-board kennels on ferries. Brittany Ferries has a very helpful section on their website to make it easier for you to travel with your beloved pets and prices starting from €99 return for dogs travelling to France. Always check with the hotel you’re booking that they are pet friendly – many already make a point of advertising the fact. Think about what you will be doing while you’re there as you may need to leave your pet in the care of staff at the hotel while doing activities they can’t take part in. Some hotels will have an entire ‘pet programme’ with toys for pets, walking and grooming services and even veterinary services so it’s worth doing some research before settling on a place. Alternatively, you can book an apartment, house or villa to stay in but again you need to make sure the owners allow pets on the premises. Of course, if you’re planning on staying here for the summer and being a tourist at home, Ireland is actually a great place for a pet holiday. Small dogs and cats can be carried free of charge on all Irish Rail trains once they are kept on a lead on your lap or in a container. If travelling by car, always make sure your pet is never left in a vehicle on a warm or hot day ensuring he/she is secure and comfortable. If your pet suffers from travel sickness, speak to your vet beforehand about ways to minimise this. Always take plenty of water with you and feed your pet no sooner than two hours before you travel, taking regular breaks along the way. Ireland also has a host of pet-friendly hotels and sites like this one and this one are a good place to start. Your kitty can sprawl out in front of a good oul turf fire and your pooch can be lord of the manor and explore the grounds of some of our finest period buildings. If you have any other tips to add to the list, please feel free to do so in the comments section below. Oh, and send us a postcard. Email “This is everything* you need to know about bringing your pet on holidays”. Feedback on “This is everything* you need to know about bringing your pet on holidays”.